Here is a pretty odd "monument" that I found in the 12th arrondissement; it's dedicated to the French veterans of the Indochina wars. Indochina was the South Asian area where France had colonies (namely in Laos, Vietnam and Cambodia) and fought to keep them (hence this monument). 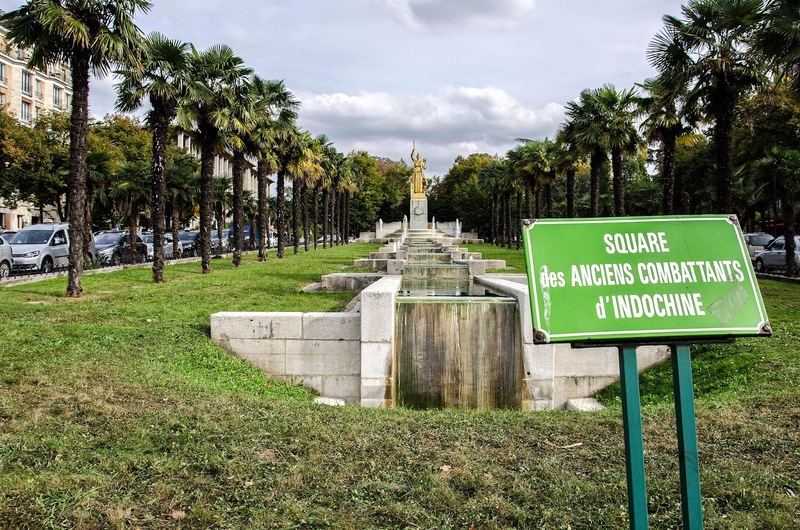 I think it's pretty ugly, to be honest, but historically interesting (they even planted palm trees even though the Paris weather is not exactly palm tree friendly LOL!). It has something of a canal locks feel to it. The palm trees are certainly interesting -- how long do you suppose they've been there? Is there water flowing in the monument? Or was there water originally? How would a visitor find this? How long? Well since 1987 I guess (when the square was made). No water on the monument itself. How to find it? Well simple, you have to go to Porte Dorée, but that's is really far from the "normal" tourist places. From previous comments I guess that's several pools with little water falls. That's nice. For Americans: The French realized at last that they could not win, negotiated independence for Laos and Cambodia, and sensibly went home. Alas, Vietnam was divided at the infamous 17th parallel. We Americans, who had gone in to assist the French as "technical advisers," stayed and escalated our "advice" into what people of a certain age remember as the Vietnam War. The view of the monument that Eric posted here has, to me, a very cold-war-era look, in spite of the palm trees. Great find, Eric. Exactly Sasho. And it lead to a war Americans still haven't recovered from. Kinda like our Guerre d'Algérie. I guess an ugly war deserves an ugly monument. Of course, the soldiers themselves deserve better. True a lot of people died for absolutely nothing! Well put, Stuart. I'm afraid even pretty palm trees can't save this. But I probably would never even know it existed if you hadn't shown us, Eric—so thanks.